Coffee is indigenous to Ethiopia and it is thought to have originated in the Kaffa province, from whence coffee takes its name. Ethiopia produces a number of distinctive coffees, and for a long time it was the coffees from Harrar which held pride of place. The introduction of wet-processing in the early 1970's allowed the coffees of the Yirgacheffe region in southwestern Ethiopia to rise to the forefront. This fragrant fair trade coffee has a distinctive citrusy aroma which is characteristic of a fine Yirgacheffe coffee. It is a lively coffee with a distinctive, interesting profile. A fine distinctive coffee with a good round body. At J. Martinez & Company, the most important consideration when we are evaluating a coffee is 'the quality of the cup'. Superior coffees command a premium, so we have always paid a premium for the coffees that we buy. The interest generated by, and the proliferation of, 'cause' coffees such as fair trade coffee -- whose higher price has not always equated with better quality -- presented us with a conundrum. However, in the last few years we have noted an improvement in the quality of the coffees offered under the various certifications. 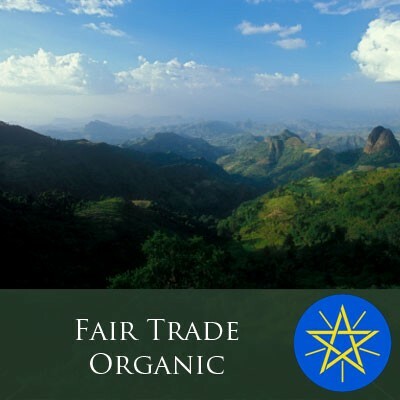 It is with pleasure that we now introduce an Ethiopian Yirgacheffe coffee that is double certified, both Fair Trade and Organic. Ethiopia grows a significant variety of coffee, which is native to that country, and Yirgacheffe is widely considered to be one of the finest Ethiopian coffees available. The beans are wet-processed, soaked in fermentation tanks for up to 72 hours after the outer layers of skin and pulp are removed. This processing method gives the Yirgacheffe coffee a higher acidity and less earthiness than dry-processed coffee beans. Our fair trade and organic Ethiopian Yirgacheffe is reasonably priced, on par with many of our other specialty coffee offerings, so there is no reason to postpone trying this smooth, flavorful coffee for yourself. Originating from the dawning place of both man and coffee, Ethiopian Yirgacheffe coffee is worth the consideration of any connoisseur.